RIM unveiled an awesome new lineup of BlackBerry smartphones yesterday, including a new touch-capable Bold, and two new models of the Torch — all of which boast RIM's latest BlackBerry 7 OS. But what about those of us with a tighter budget? How do we get our hands on BlackBerry 7 OS? "We're learning a lot about the market we've exploited with Curve; that range helped us open up new price points as well as services such as BBM and email. "What's interesting is the feedback we're getting is once those people have become used to those services is they want to do more, and we see that group of customers as a great base for BlackBerry. So we intend to serve them very well at a future point." 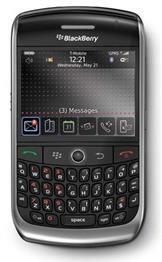 The BlackBerry Curve has been RIM's entry-level smartphone since it launched in 2003 — allowing customers to access the BlackBerry OS without the premiums that come with its more advanced devices. It's no surprise, then, that the Curve is popular with students and businesses here in the U.K. — surely one of the reasons why the Curve has helped open up services like BlackBerry Messenger and email. "What [the improved apps are] doing is giving those people that chose BlackBerry for improved communications and a better social networking experience more enhancements and better capability. "However, there is a hardware dependency for some of this capability, which will be subject to announcements later." It certainly makes sense, given its current slump, that RIM would want to maintain interest in its Curve and not lose customers to cheaper smartphones from other manufacturers. The Android platform is notorious for cheaper devices, but entry-level Android smartphones that are often lacking in power may not satisfy those that have grown to love the BlackBerry. Will you be looking forward to RIM's new budget BlackBerry?